When Summer took a job as a nanny for a couple vacationing in Belize, she imagined it would be a fresh start before starting college in the fall. And while she adores her charge, Josh, she can't say the same for her employers' oldest son, Bray. He's cocky, inconsiderate, and makes her feel she's a chore he has to put up with. In short, he's everything she dislikes in a guy. Bray had a plan for the summer: party, hang out with friends, and forget all the responsibilities waiting for him back home. But every time he's forced to be around Summer, her dour, serious mood sets him off. Not to mention she has a habit of picking up on what he already knows is wrong with him. 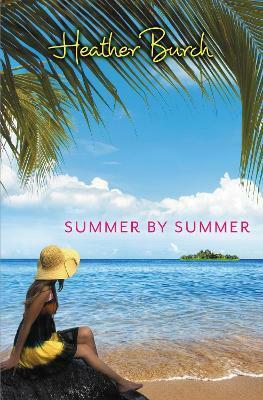 Summer by Summer by Heather Burch is a fast-paced book that you'll have no trouble devouring while hanging out on the beach just a few steps from the ocean. The tension between Summer and Bray picks up within the first few chapters, and you immediately get a feel for both of them. They each have their flaws, but they also each have their own compelling reasons for why they act the way they do. The heart of the story is revealed when the pair find themselves on the deserted island. Bray and Summer discover that the other is more than what meets the eye, and it is this tangible push-and-pull relationship that will have you flipping pages faster than you thought possible. The opening of the book is actually a snippet of the ending, and that uncertain moment will be in the back of your mind throughout the entire novel, giving you yet another reason to fly through the pages. The chemistry in Summer by Summer is the true highlight of the book, and it is both undeniable and natural. As stereotypes are broken down and cast out to sea, you'll fall in love with both characters as they fall in love with each other. * Hypable * The past year has been rather challenging for Summer, and she's hoping that her new summer job as a nanny for a family vacationing in Belize will be just what she needs to get her mind back on track before college starts. Summer's charge, Joshie, is wonderful, and she gets along great with her employers. Unfortunately, she can't say the same for their older son, spoiled party-boy Bray. At the urging of his parents, Bray agrees to take Summer out as part of a tourist dive group, but things go horribly wrong. The two ended up stranded on a seemingly-deserted island, and as they learn to rely on one another for survival, they each discover that there is more to the other than first thought. Heather Burch's novel Summer By Summer is a new take on a classic survivor story. Despite its lackluster beginning-the animosity between Summer and Bray comes across as forced and without any real motivation-this book develops into a sweet romance without ignoring the overarching survival story. Heather Burch, the author of the popular Halflings series, spent the last seven years in Southern Florida but recently returned to her hometown in the Ozark Mountains. Her books have garnered praise from USA Today, Romantic Times, and Booklist magazine. When not working on her latest novel, she can be found hiking in the hills or planning a trip to the beach with her husband, John, who is her hero in every way.